- Ideally located in Glasgows Merchant City, this newly refurbished hotel is surrounded by an abundance of culture. From exclusive designer shops including Ralph Lauren and Jaeger to a huge range of great bars and restaurants, its easy to see why Glasgow was recently described as one of the most vibrant cities in Europe. All Ramada Jarvis Hotels offer a Media Package in all rooms. This package includes High Speed Internet Access and 24 Hour movies. This is payable at the Hotel or Complimentary in Executive DL2 Rooms. 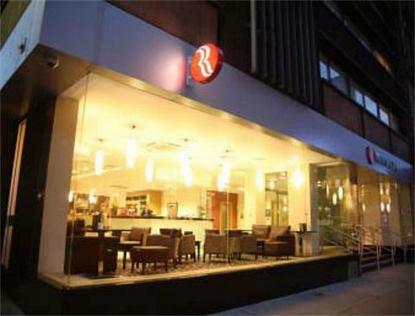 -Ramada Glasgow City is perfectly placed to see it all. Just ten miles from Glasgow Airport, a five minute walk from Glasgow Central Station, Scottish Exhibition and Conference Centre and the main high street, everything you need is within easy reach - 90 rooms - Separate work desk - Satellite television - Pay-per-view movies - Direct dial phone - Bagios Bar and Cafe - Onsite parking - charge - Please read our Childrens Policy. A Child is between 4 and 15. Under 4, No Charge. Children sharing adults room pay for food as taken. Children in their own room pay 50 Percent of the adult rate. Midweek - the same rules apply with adult paying single supp if applicable.